My elderly Dad has been in hospital this week for some major surgery so my thoughts in recent days have inevitably been focused on how bad the NHS is at patient/relative communication. But getting specific here wouldn’t win me any friends in the High Dependency Unit so the obvious connected topic is the human side of CRM. In my experience, organisations tend to be great at communicating with potential/brand-new customers or existing customers but very rarely both, failing to appreciate that their ‘quick win’ is making the most of when people are looking for or initiate contact. Because that’s when under or over performing will be remembered – and the old maxim that unhappy customers spread the word much further than happy ones still stands true. Just take Comcast’s epic customer service fail last month which went very, very viral – and here’s the HBR on how Comcast created an environment that allowed that to happen. So why do organisations get it so wrong? My experience running workshops looking at the Customer Journey suggests that because there isn’t a tangible ‘patch’ for the problem like a new website or leaflet they often struggle to identify and then implement a solution. Because of the one-on-one nature of so much customer/potential customer contact, poor performance can be a hidden problem that organisations often don’t even realise they have. In addition, customer contact is something that relies so much on individuals to get right at the point of contact so unless there is a rock-solid culture and processes that make sure nothing is missed while flexing to suit the situation even the best staff will flounder. 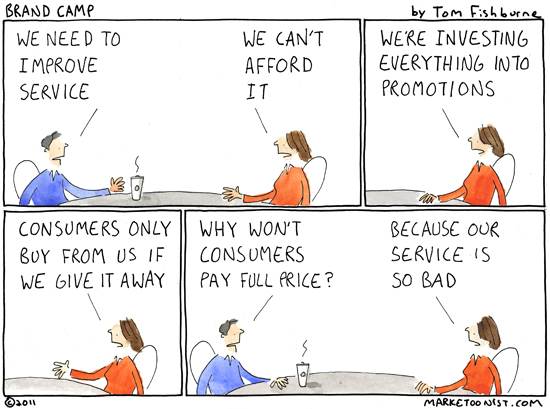 You can have the world’s best website, award-winning product and an epic CRM computer system, but if your organisation holds back your people from giving great customer service than you’re missing the biggest marketing win of all.